Your browser does not support the video tag. Ingredients 3 ¼ cups (800 mL) cake and pastry flour, sifted 1 tsp (5 mL) baking powder 1/2 tsp (2 mL) baking soda 1/2 tsp (2 mL) salt 2 cups (500 mL) Lactantia® European Style Butter, Unsalted, room temperature 2 ½ cups (625 mL) sugar 8 eggs, room temperature 2 tbsp (30 mL) finely grated lemon zest 1 tbsp (15 mL) vanilla extract 1/2 cup (150 mL) fresh lemon juice 2 cups (500 mL) blueberries Cream Cheese Lemon Glaze: 4 oz (125 g) Lactantia® Original Cream Cheese, room temperature 2 cups (500 mL) icing sugar 1 tbsp (15 mL) finely grated lemon zest 1/3 cup (75 mL) fresh lemon juice Instructions Preheat oven to 350°F (180°C). Grease and flour 10-inch (25 cm) tube pan. Whisk together flour, baking powder, baking soda and salt; set aside. 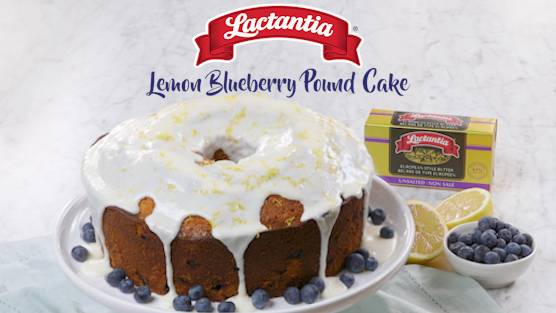 In separate bowl, beat together Lactantia® European Style Butter and sugar using hand mixer until light and fluffy. Beat in eggs one at a time, incorporating each fully before adding next one. Beat in lemon zest and vanilla. With mixer on low, beat in flour mixture alternately with lemon juice, starting and ending with flour mixture. Scrape bowl as needed between additions. Do not over mix. Fold in blueberries. Scrape batter into prepared pan; smooth the top. Bake 80 minutes or until a tester comes out clean when inserted into centre of cake. Let stand 2 hours before turning cake onto wire rack to cool completely. Cream Cheese Lemon Glaze: Beat together Lactantia® Original Cream Cheese, icing sugar and lemon juice until smooth, creamy and pourable. Pour glaze over cake. Sprinkle with lemon zest. Let icing set before slicing. Preheat oven to 350°F (180°C). Grease and flour 10-inch (25 cm) tube pan. Whisk together flour, baking powder, baking soda and salt; set aside. In separate bowl, beat together Lactantia® European Style Butter and sugar using hand mixer until light and fluffy. Beat in eggs one at a time, incorporating each fully before adding next one. Beat in lemon zest and vanilla. With mixer on low, beat in flour mixture alternately with lemon juice, starting and ending with flour mixture. Scrape bowl as needed between additions. Do not over mix. Fold in blueberries. Scrape batter into prepared pan; smooth the top. Bake 80 minutes or until a tester comes out clean when inserted into centre of cake. Let stand 2 hours before turning cake onto wire rack to cool completely. Cream Cheese Lemon Glaze: Beat together Lactantia® Original Cream Cheese, icing sugar and lemon juice until smooth, creamy and pourable. Pour glaze over cake. Sprinkle with lemon zest. Let icing set before slicing.